The two-dimensional Cartesian coordinate is defined by two axes, at right angles to each other, forming a plane (the xy-plane). The horizontal axis is labeled x (sometimes called abscissa), and the vertical axis is labeled y (sometimes called ordinate). The point of intersection, where the axes meet, is called the origin, which is normally labeled O. To specify a particular point on a two dimensional coordinate system, you indicate the x unit first (abscissa), followed by the y unit (ordinate) in the form [x,y]. The two intersecting axes create four quadrants which are numerated counter-clockwise by Roman literals. 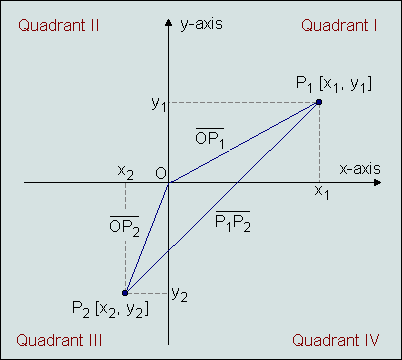 For example, the point P1 in the figure below lies in the first quadrant, the point P2 is located in the third quadrant. Two points in the cartesian coordinate system.